There has been a worldwide outpouring of support for Haiti after the devastating earthquake in January. Governments contributed on behalf of their countries. Individuals donated time, money, and materials. Our son spent time in Haiti helping deliver much-needed healthcare. Last night I took in a soccer match at Austin’s House Park and what a perfect night for a game — temps in the 70’s, mild breeze. What does that have to do with Haiti? 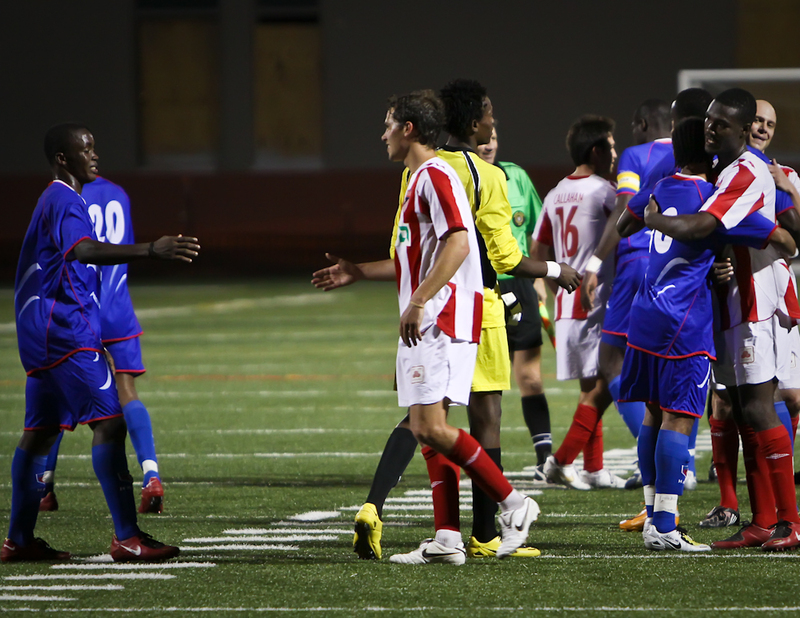 The game was friendly match between the Austin Aztex (pro team in the USL) and the Haitian National team. The Haitian team has no home currently because their stadium is serving as housing for displaced Haitians. The Aztex did not charge for attendance and donations of cash, cleats, and other soccer gear to benefit Haitians were being taken at the door. I brought the camera along just for fun. I took some shots here and there but mostly concentrated on watching the game. Although I have zero experience with sports photography, I managed to capture a few cool action sequences. However, the images that are my favorite were captured *after* the match. I had wandered behind the goal for the last few minutes of the game. The whistle blew and I prepared to make a beeline to the exit. What stopped me was the fact that as soon as the match ended, the players who had been adversaries for the past 90+ minutes suddenly became friends and began to hug each other. That isn’t unusual after a sporting event but I had a sudden sense of what the Haitian team members must be going through emotionally. I flipped the camera back up and captured a few images of this scene. Oh — the match was a 0-0 draw. This entry was posted on April 29, 2010 by michaeltuuk. It was filed under Austin, Misc, night, Photography, texas and was tagged with 2010, austin, aztex, donation, earthquake, event, football, game, haiti, haitian, house, match, national, park, Photography, professional, soccer, sporting, team, texas, usl. Great shot! Who cares about an action sequence; this is about connecting to another human. Well done, Michael! I agree — as soon as I saw this I knew it was the most meaningful action of the night.